Samsung Gear Sport v Fitbit Ionic: Which sporty smartwatch should you choose? Picking between smartwatches is never easy, and the case is no different when it comes to the Fitbit Ionic and the Samsung Gear Sport. 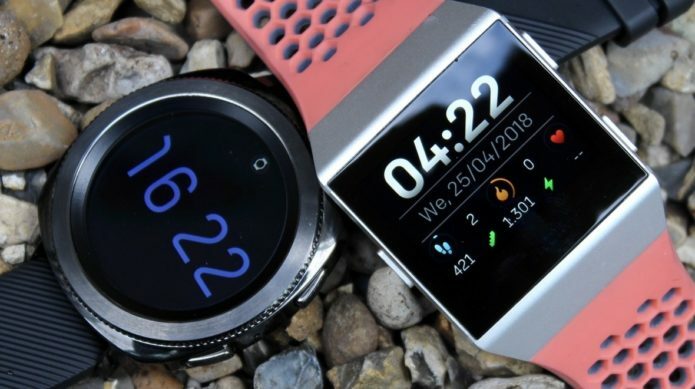 While Fitbit only recently entered the smartwatch market, Samsung was one of the early entrants onto the scene, and now the two have rounded their smarts into sporty, fitness-focused watches that also add a bit more style to your wrist than the dedicated GPS sports watches from the likes of Garmin and Suunto. 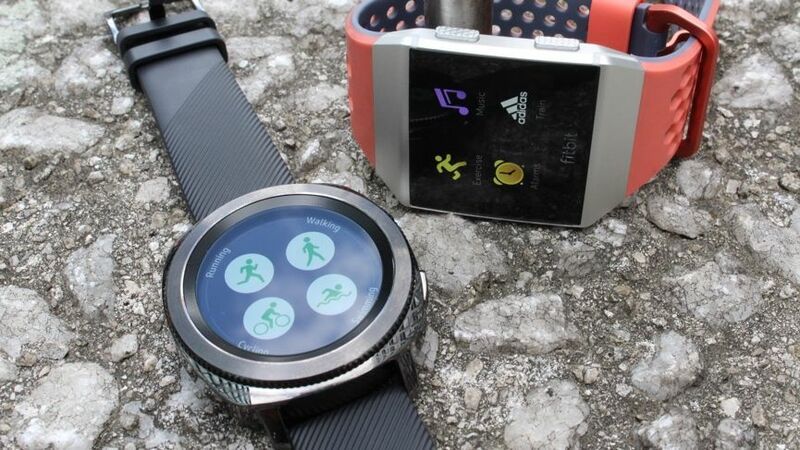 But when these two smartwatch heavyweights do battle, who comes out on top? Well, we’ve been living with the pair for the past few weeks in order to find out. Read on below to see how they compare in design, features and battery life. Both of these watches live and die by the features packed inside, but that doesn’t mean the designs are created equally — and it’s certainly a factor in which comes out on top. 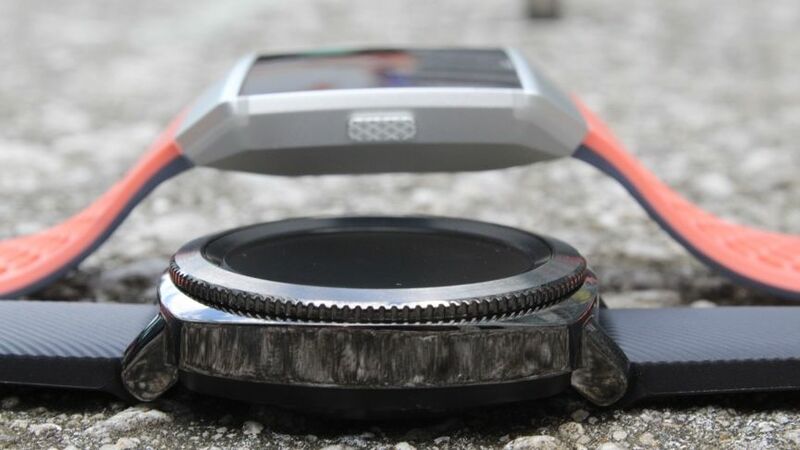 When we first laid our eyes on the renders for the Fitbit Ionic, our collective view was that device lacked in the design department — it was blocky, it didn’t ooze style and also didn’t look overly dissimilar to the Fitbit Blaze. But after testing the smartwatch thoroughly since launch, as well as over the past few weeks, the design has grown on us somewhat. It’s still not the most attractive wearable in the space, but it’s also not completely bereft of looks. And while certainly one you’d prefer to wear in the gym over a formal event, switchable bands make this a slightly more versatile option. In contrast, the Samsung Gear Sport foregoes the square style of the Ionic and instead opts for the circular face that’s been a feature of its Gear S line since the beginning. And something which also makes a return is the rotating bezel, which makes navigation around the smartwatch’s menus a cinch. Like the Ionic, bands can also be switched out to exchange the standard, sporty look and instead opt for something from the Hybrid (leather and rubber) or Nato (nylon) collection. In this regard, the Ionic is far simpler to change between bands, but you shouldn’t struggle too much if you want to consistently mix things up on the Gear Sport. In terms of dimensions, the 42.9 x 11.6 mm Gear Sport is bigger than the 38 x 12mm Ionic, though that slightly wider design doesn’t really feel too different on the wrist, despite the Gear Sport also weighing slightly more than its counterpart. With the display, Fitbit’s Ionic houses a 1.42-inch LCD screen which beams out pixels at a 348 x 250 resolution, compared to the 1.2-inch AMOLED display from Samsung, which has a slightly higher pixel quality — 360 x 360. In truth, though the specs favour Samsung in this regard, it’s tough to tell the two apart when working at full capacity. Both offer you a decent look at the face, even in strong sunlight, and won’t leave you shortchanged in terms of brightness or clarity. We’ve talked about bands, but there are also different variations of cases to be aware of, too. With the Gear Sport, you can opt for either the black or blue, while the Ionic features gold, silver and grey models — as well as the Fitbit Ionic Adidas Edition, which gives you access to exclusive faces and bands. For our money, the Gear Sport wins out in the design department. Not only is it far simpler to use the rotating bezel and two side buttons to get around (as opposed to Fitbit’s three side buttons), but we still think that the Ionic is more divisive when compared to the clean, more circular look of the Sport. This achieves the look of a traditional smartwatch in a far more convincing fashion than Fitbit’s attempt. 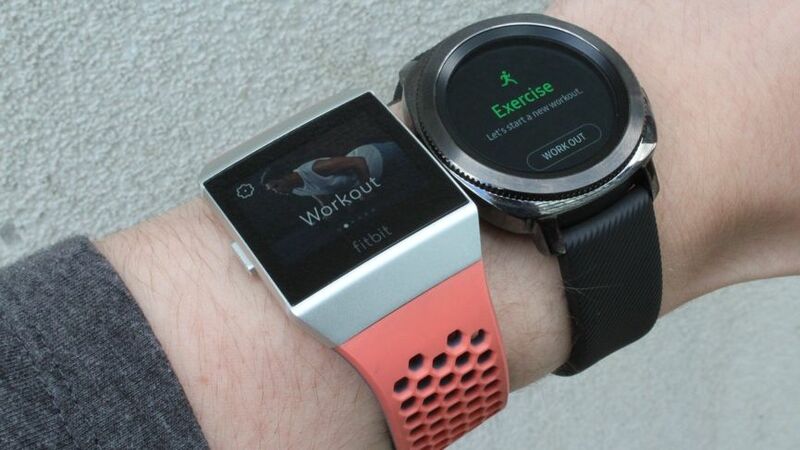 Whatever your take is on the design of these two smartwatches, what you can’t dispute is what’s going on under the hood. And since we’ve comprehensively tested the pair out for our full reviews, let’s dive into how the two compare on paper. Since this is Fitbit’s first smartwatch, it’s also the device which debuts many of the company’s first forays in software. Sure, you have things like in-built GPS, heart rate monitoring and water resistance up to 50m, but the smartwatch is also a portal for Fitbit Pay, Fitbit Coach, standalone apps and watch faces. Pay is still progressing, as Fitbit looks to lure more banks onto its system, and Coach is yet to move past the three exercises it launched with, but there’s plenty of potential here. Add this to the growing list of developer additions in the App Gallery and Clock Faces sections, and it healthily backs up the standard features. In our time with the Ionic, we’ve found GPS tracking to be fairly close to the Apple Watch in lock-on time, while also staying respectably close to Garmin in terms of accuracy. Don’t get it twisted, you won’t be able to track everything with the Ionic, but you are able to track the big hitters — running, swimming, cycling and strength training — with ease from the watch, with some even featuring modes for indoor equivalents. All this, and we haven’t even mentioned the seriously impressive sleep tracking, which we consider the best you can get from the wrist. And like activity, all tracked data is stored within the intuitive app — again, one we consider to be the best from the range of companion apps provided by the big wearable players. That brings us on to the Gear Sport, the first Samsung smartwatch to bring water resistance to the fore. This new water tolerance is also backed up by a partnership with Speedo, which adds onto the usual fitness and wellness equation — including an on-wrist look at heart rate, calories, steps and more. In our experience, the GPS accuracy is more hit and miss than the Ionic, while the optical heart rate monitor like the Ionic’s typically struggles with things like interval training and keeping up with fluctuating heart rate in real-time. Back to the more smartwatch-y features; let’s just add a note on notifications. Both the Gear Sport and the Ionic offer quick rely support, although on the Ionic it’s only available for Android phone owners with support heading to the iPhone and Windows Phone later this year. Both allow you to pull in the likes of texts, emails and third-party notifications which you can toggle. In terms of how this actually works in practice, well, we’ve found the Sport much better in this regard, simply because the Ionic has glaring inconsistencies with actually pulling them in. As far as music streaming is concerned, the two also differ quite greatly. Samsung, of course, is the only smartwatch maker to offer offline Spotify playback — a big tick over its rivals. Once you’re all logged in and synced up, you’ve got 4GB of built-in storage to play with, which is about 500 songs. Fitbit offers a similar offline streaming equation, though its partnerships sit with the less popular Pandora in the US and Deezer in Europe. Just remember you’ll need a pair of wireless Bluetooth headphones to enjoy streaming your tunes. The Sport does bring some strong suits, such as its music playback, but there’s also some omissions. Samsung Pay’s big advantage over rivals – MST support – is no more, and sleep tracking still isn’t in the equation from the company. It also includes a microphone, allowing you to order commands at your wrist, though you’ll only have access to S Voice and not Bixby. Fitbit, in contrast, has nothing of the sort. There’s naturally some similarities here, but also some important differences. The Gear Sport’s design is more attractive in our eyes, as we’ve mentioned, but the Fitbit Ionic is currently the greater device in terms of software and tracking. There’s potential features dropping further down the line for the Ionic, while the accuracy issues and limitiations in the tracking department hold the Sport back. It’s important to keep in mind that battery life is what you make of it, but both of these smartwatches do perform fairly strongly in this area. The Fitbit Ionic still offers the best life among its peers, offering around four days of juice with balanced use, with that even stretching out to five if you’re tweaking some of the settings. Meanwhile, GPS battery life sits at around 10 hours. The Gear Sport isn’t quite as strong, offering around three days with general use, though you can hit around 14-15 hours in continuous GPS tracking. Unless you’re desperate for that GPS battery, the Ionic wins out comfortably here, and this is also bolstered by the fact that it uses this battery more efficiently, since during the nighttime hours it’ll be monitoring your sleep. 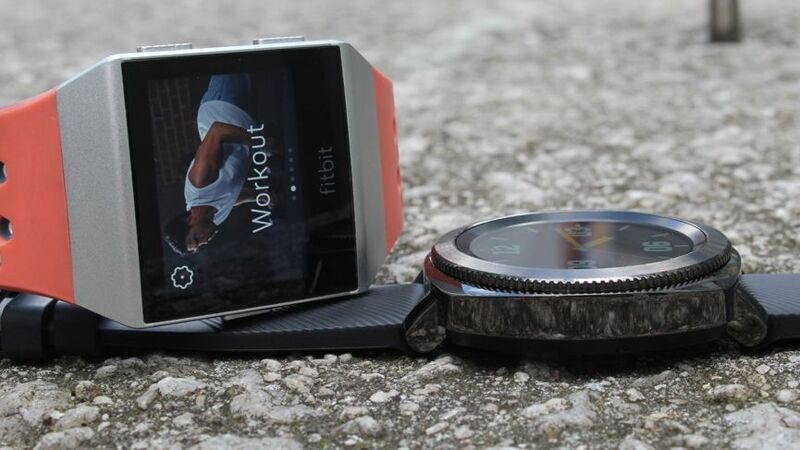 Both of these smartwatches have seriously strong suits, making them worthy options for you to consider putting on your wrist. But with the pair offering some differences, this one really comes down to preference. If you really value music streaming, an attractive design and don’t necessarily care about the likes of contactless payments, the Gear Sport is likely the device for you. But if you’re interested in sleep tracking, strong battery life and don’t mind waiting on features coming further down the line, such as women’s health tracking, sleep apnea tracking and more apps, opt for the Fitbit Ionic. As both offer a fairly similar experience in activity tracking – save for Samsung’s swimming smarts through Speedo – this area really comes down to accuracy. And in our use, the Fitbit was slightly more consistent in pinning our routes, distance and heart rate.